Like champagne and caviar, life is meant to be lived lavishly! Indulge and savor the rich radiance of this deliciously decadent bag by Moschino Cheap and Chic™! 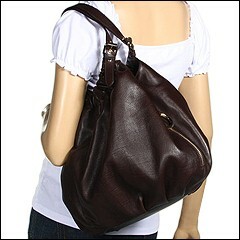 Hobo style shoulder bag made of luxe leather. Holds your wallet, sunglasses, personal technology, a paperback novel, a deck of cards, and a healthy snack. Dual shoulder straps. Shoulder drop: 6 3/4 length. Side exterior zip pockets. Classic Moschino detailed hardware. Platform bottom. Inside magnetic snap closure. Richly colored interior lining with a back wall zip pocket. Dimensions: 15 1/2 wide x 5 deep x 11 1/2 high. 32.00 oz. Made in Italy. Free shipping in the USA.